I’ve been making this Mushroom Soup for over 35 years and I LOVE it every time I make it. Because it is a hearty, creamy soup I typically make it in the winter – but it always, immensely satisfies. With so many mushrooms it has an intensely deep, rich flavor and has become a favorite of friends every time I share the recipe. It’s a wonderful recipe to make for a dinner party too – tastes so fancy but really quite easy to make. Many years ago, back in my college days, we used to frequent a restaurant called The Grape, located on Greenville Avenue, in Dallas, Texas. The very reason we would go to this restaurant was to order this wonderful and flavorful Mushroom Soup. Thirty five years later, The Grape Restaurant is still going strong, it is still in the same location, and it still serves this favorite and now infamous, Mushroom Soup. 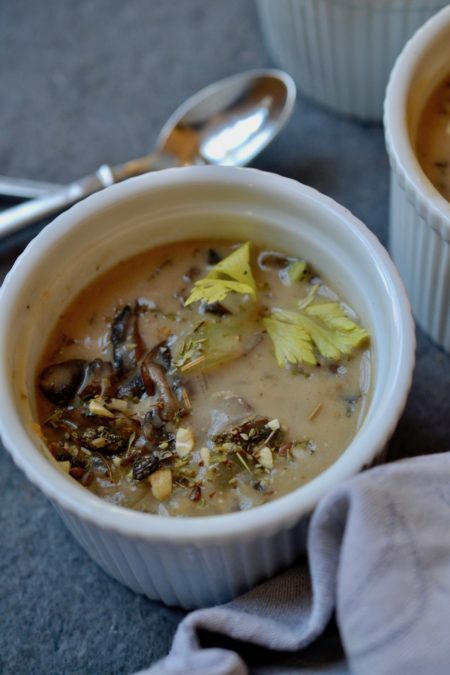 Over the years, I’ve adapted The Grape’s own recipe just a bit and infused the soup with some of our Glory Kitchen Provence nut & spice mix to add a bit of French flair to the Mushroom Soup flavors. The Provence blend adds just the right amount of herbs with the thyme, marjoram, savory, and basil and the little currants give it a touch of sweetness – a nice flavor burst. Concerning the type of mushrooms to use in this soup, I don’t really fret with an exact variety. When available, I do like to mix them up and try to include cremini, shiitake, oyster, and enoki mushrooms, but if all you can find is the typical button mushroom, don’t be afraid to go with that too. Mushrooms of all varieties will work in this soup. When they are sauteed and browned with the butter, the flavor becomes wonderfully intensified and makes a terrific soup no matter which variety you end up using. I am a true soup lover and this Mushroom Soup recipe is made at least once a year – I hope you enjoy it as much as we do and make it on repeat year after year. Melt butter in heavy stock pot. Add chopped onions, celery, and Provence nut & spice mix and cook over medium heat until the veggies are translucent. Add all the mushrooms and cook for 10-12 minutes, or until liquid has cooked out of mushrooms and they are soft. Lightly sprinkle in the flour and blend, cooking for a few minutes to remove the raw flour taste. Add the beef stock, and the white wine, just a bit at a time, whisking well to make certain there are no lumps. Once all the stock and wine have been added, add white pepper and fresh nutmeg and slowly bring the mixture to a boil. Immediately reduce the heat & simmer for 10 minutes, stirring occasionally. Remove the pot from the heat source, slowly add cream and serve warm.